Donna Webster took it as a compliment when a landlord told her she was the first property manager who had never managed to brass him off! Donna sold rural real estate for Eves for nine years before taking up the role of property manager in 2009. Her working career began as a secretary then progressed to sales, all good grounding for her property management role. She has a well rounded real estate background having owned rental properties and completed subdivisions with her husband. Property is in her blood. Her grandfather owned a real estate company in Wellington. 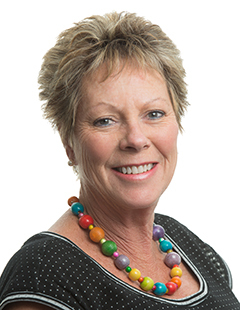 Donna brings to her role a sense of fairness with great respect for all her clients. She enjoys the relationship building the job requires and loves to achieve a happy outcome for landlords and tenants. "I can be very firm when necessary too, " she says, noting that not only is communication and regular reporting essential but also tolerance and understanding of life situations. I would like to say thank you so much for supporting our family when we first moved here from Auckland to the BOP by helping us to find accommodation. Without you this would have been so much harder! Thank you for being an amazing rental support for the short time you looked after us. So far so good with the landlord looking after us. Thanks once again. We write to confirm that our house has been sold. We want to say thank you for the way you regularly inspected the property and your reports to us were all of a high standard. Also the extraordinary effort you made to ensure tenants of good character were selected. Not always an easy process, we can understand. Please extend our thanks to Eve's staff who have also been involved. We have been fortunate indeed to have your care. All the best for the future. In handing over the management of my rental property to Donna Webster I was relieved of all the stress involved in collecting rent, selecting tenants, inspecting the property - generally worrying about it. The commission I pay every month is absolutely worth it for the weight that has lifted from my shoulders. A hug thanks to you for managing the property for the last two years. We're very happy with your work and the tenants were happy with your management. Thanks for your professionalism as usual. I have never regretted getting my property managed. Thanks for being a great property manager - you always got things fixed and were great to deal with. We loved living in the unit and hope the owner is happy with the way we left her house. Thanks for all your help during the course of my tenancy. It has been a pleasure working with you.